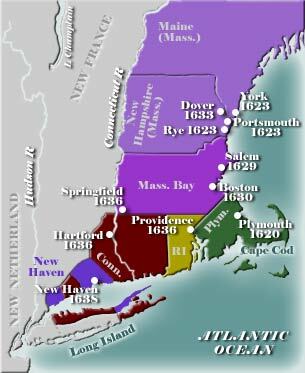 New Hampshire differed from other New England colonies in that it was not founded by religious dissenters, but was intended from the beginning to be a commercial venture. The primary attraction was fishing, but timber and fur soon became important segments of the economy. Early European explorers who left records of their ventures included Englishman Martin Pring, who investigated the Portsmouth area in 1603, and the renowned French explorer Samuel de Champlain, who mapped the coastline in 1605. John Smith, the early Jamestown settler, surveyed the coast of New Hampshire in 1614. Noting the excellent fishing, he wrote, "What sport doth yield a more pleasant content and less hurt or charge than angling with a hook, and crossing the sweet air from isle to isle over the silent streams of a calm sea?" Smith referred to the region as North Virginia, but the name was changed to New England by James I. In 1623, the Council for New England granted a charter to Sir Ferdinando Gorges and Captain John Mason for the lands between the Kennebec and Merrimack rivers. Gorges took control of the central portion of the grant, which he named Maine. Mason called his western portion of the area New Hampshire, in honor of his home county in England. Both of the proprietors proved to be ineffectual. Mason at least made an effort by sending Thomas and Edward Hilton, London merchants, and David Thomson, a Scot, to found a fishing colony in the area. Thomson's group established a settlement called Pannaway (present-day Rye) while the Hilton group set up Northam (Dover). Other towns developed at Kittery, York, and Portsmouth, the only significant seaport, all largely independent of the efforts and intentions of Mason and Gorges. The migration of disgruntled Puritans from Massachusetts and Connecticut added significantly to the area’s population at Hampton and Exeter. As a consequence of the increasing Puritan presence in these regions, the Massachusetts Bay Colony officials gradually exerted governmental control in the vacuum left by the inept proprietors. New Hampshire settlements were incorporated between 1641 and 1643, and Maine was purchased from the proprietors in 1677. In 1679, Charles II of England made New Hampshire a separate political entity and granted it a royal charter. Maine did not fare as well and remained part of Massachusetts until it achieved statehood under the provisions of the Missouri Compromise in 1820. See: Settlement of New Hampshire.